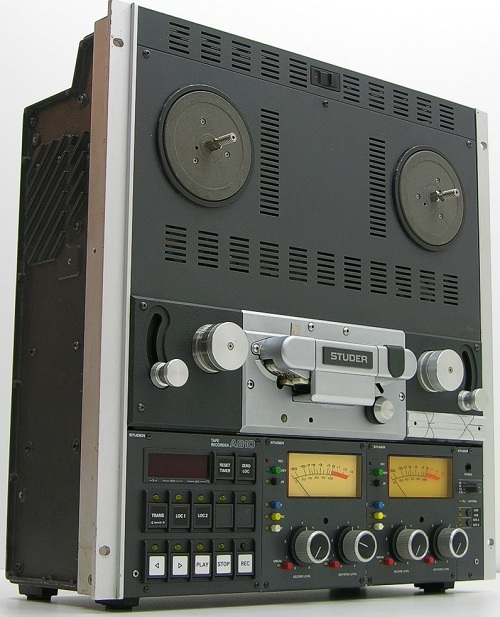 By virtue of its compact and highly rigid construction, its inherent system flexibility, and the superior operating convenience achieved by the microprocessor control system, the STUDER A810 tape recorder is universally suited for applications in broadcarsting or television, for use in studios or on OB vans, in theaters, film studios, and scientific institutes. ■ Manually manipulatable head shield above record and reproduce heads; can stay closed during spooling. ■ Capstan motor servo control with quartz-conrtrolled reference and capacitive sensing tacho system for highly accurate tape speeds. ■ Gentle tape handling is ensured by electronically controlled tape tension, servo-controlled AC spooling motors, and non-contacting tape tension sensors. Pulse-width-modulated spooling motor control minimizes power dissipation and requires no separate heat sinking. ■ Accurate electronic tape timer with real-time display; photoelectric scanning of guide roller rotation by opto switches. ■ Convenient editing; four spooling speeds; the high end of the reproduce frequency response is de-emphasized for speaker protection; tape lift during spooling can be defeated either by pressing a button or mechanically by shifting the pressure roller. Blocked tape tension sensors and decreased braking torque in STOP mode. A tape marker and built-in tape scissors are available as options. ■ Standard types in mono, 2-channel or stereo versions, with or without VU meter panel. ■ Operates in any position from horizontal to vertical, suited for 19" rack or console mounting. Available as a box-mounted model with removable lid or portable model with lateral handles or wooden side panels with handles. ■ LS versions; 3 Tape speeds (3.75 - 7.5 - 15 ips) selectable with front-panel rotary switch. Time code operation not possible at 3.75 ips. ■ HS versions; 4 Tape speeds (3.75 - 7.5 - 15 - 30 ips) selectable with front-panel rotary switch. Time code operation not possible at 3.75 ips. ■ Inputs and outputs balanced and floating, available with or without input/output transformers. ■ Switch for NAB or CCIR equalization (7.5 and 15 ips). ■ Tape bias switch for two tape formulations with different calibration data. ■ Sync facility, zerolocator, and 4-address transfer locator (autolocator) included as standard features. ■ Output selector buttons: INP (input), REP (reproduce) and SYNC. ■ VU-meter panel with SAFE/READY switch, record and reproduce level controls, buttons for bypassing the level controls (calibrated, with Line level). Internally switchable level meter; VII or PPM indication. ■ Selectable line voltage; 100, 120, UO, 200, 220, 240 VAC ±10%, 50...60 Hz. ■ Terminals for connecting fader start, parallel remote control and varispeed control. ■ For synchronizing: time code system for 2-channel models; code channel as third track between the stereo audio channels. ■ Mono/stereo switch for stereo and 2-channel recorder. ■ Test generator (60, 125 Hz, 1, 10, 16 kHz). ■ Remote controller to serial interface; for storing (e.g. 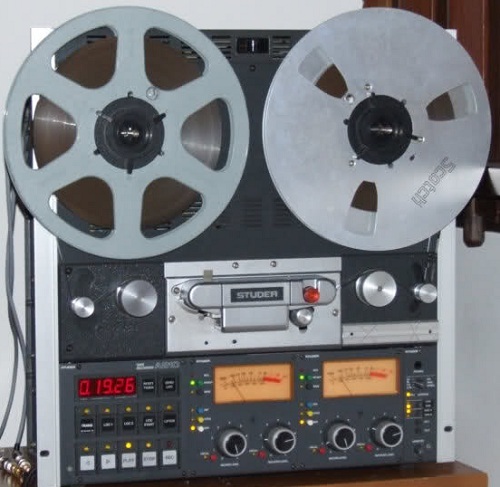 on tape) audio parameters for quick audio setup or for operation in conjunction with a terminal (RS 232 interface). 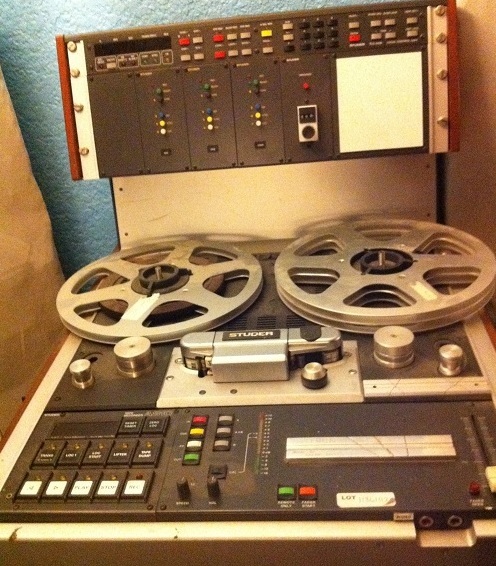 ■ The Last operating state of the recorder is preserved when power is switched off: tape counter. Locator addresses, audio parameters, speed, mono/- stereo or tape A/B and NAB/CCIR. ■ If a channel controller exists, the audio signal is automatically switched to REPRO and SAVE when power is switched on again. ■ Drop-in activated by pressing only the REC button in reproduce mode or by pressing PLAY and REC (depending on internal programming). ■ Drop-out from record mode by pressing the PLAY key. ■ Reduced spooling speed: the full spooling speed (approx. 10 m/s) can be swtched down to 7, 4 or 1 m/s. ■ Zerolocator: automatic search of tape address (timer reading) 00:00. ■ Transferlocator LOC 1 ... LOC 4: for storing and automatic searching 4 different tape addresses. Stored addresses can be displayed without executing the actual search command. ■ Audio setup via microprocessor. 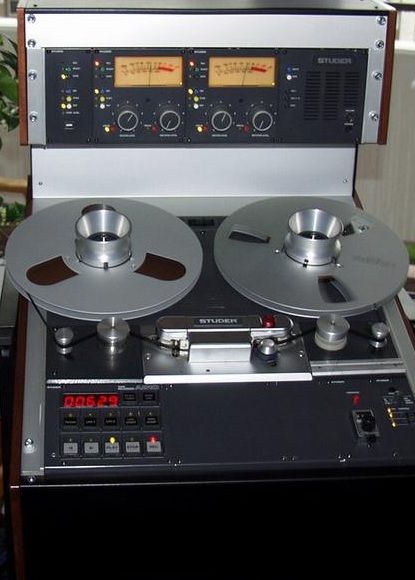 The following audio parameters can be programmed with the keys accessible from the front below the operator panel (NAB and CCIR equalization each for two types of tape): Reproduction / Sync: LEVEL, TREBLE, BASS, EQUALIZATION Recording: LEVEL, TREBLE, BIAS, EQUALIZATION Resolution 256 steps each, hexadecimal format on tape timer display. The audio parameters remain stored even after the recorder has been switched off. They can also be saved by copying them through the serial remote port to an external storage medium from where they can subsequently be reloaded; this means that automatic and reproducible audio set-up of the A810 is pos sible. Automatic check for correct functioning when the recorder is switched on; a subset of the test is periodically repeated. Foundational text courtesy of Studer. 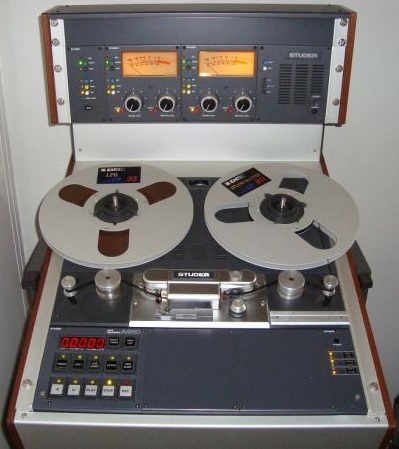 Do you have content, to add, about the Studer A810 Tape Machine or associated topics? Please feel free to Share it, here!